WHAT ARE THE ALL ON 6 TECHNIQUES? 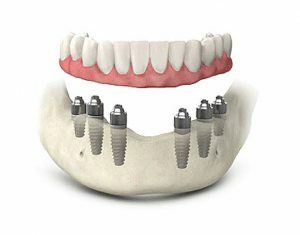 The All on 4 and All on 6 techniques offer patients with a total or partial loss of teeth a dental prosthesis consisting of a fixed, full arch on four dental implants, in the case of All on Four, or six implant, in the case of All on Six,on the same day as the intervention. Patient’s quality of life improves rapidly: the specialist simultaneously places a fixed, full-arch prosthesis on four or six implants on the same day as the dental implant surgery. Treatment times are much shorter: the number of interventions is reduced considerably and the immediate placement of the dental prosthesis on the same day as the intervention also minimises the time in obtaining the final teeth.